Muslin Maker | Because sewing's more fun when there's no hemming. Because sewing's more fun when there's no hemming. In the previous post I mentioned that I’d like to make a knockoff of the Madewell Morningside dress and though some things went very wrong with this one, it’s closer than I’d expected my first version to get. I used the a-line tank dress, Burda 06/2011 #107 with some changes. First, I added a yoke–measuring down about four inches from the back neck for the yoke in the back and down about two inches in the front. 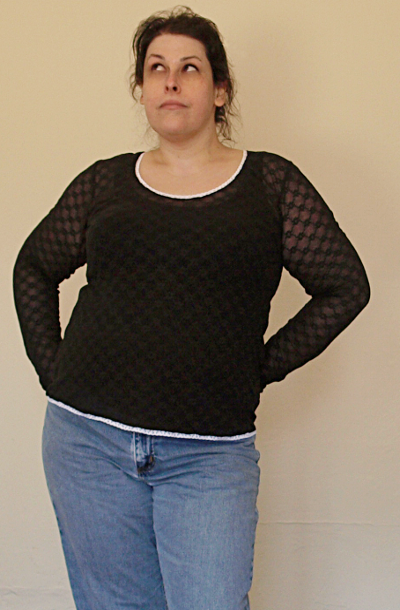 Next, I changed the neckline–closing it up a lot. Of course, once I’d gotten it sewed up, it felt a little weird, so I opened it into more of a v–so it probably (approximately) matches the original draft now. The only other change I made to the pattern was to the hem, adding a curve and a small vent. I sandwiched a simple mandarin collar between the two yokes (which worked really well–I’ll definitely sew it that way next time) but my collar was both too wide and too long around the neck and flopped around weirdly. I didn’t want to rip out the neckline, so instead I trimmed away the collar and of course wound up cutting into my yoke accidentally in one small spot (that’s fixed now). The neck edge doesn’t look as tidy without the collar, but it’s wearable. For the next version, I’d like to either include the band collar (I’ve already reduced the size of the pattern piece), or perhaps add a long neck bow. I also plan to make the back yoke deeper and the front yoke more angled (so it’s longer at the arm and shorter at the neck). The inspiration dress has a neck facing that’s top stitched in place, and I think I’ll try that treatment on mine as well. I’d also like to make the cap sleeves a smidgen longer, but I’m not 100% sure how to do that properly, so we’ll see if my guess works or not. Side seams are finished with french seams. For the hem, I used Wonder Tape, adhered to the right side and folded over twice for a tidy top stitched hem. The arm openings are finished with bias binding that’s then top stitched to the inside because I wanted to lose as little length on the sleeves as possible. The fabric is a fantastic rayon challis from Fashion Club Fabrics. It was a little stiff when it arrived, but washed to a lovely softness. To cut it out, I starched the heck out of it and then left it starched through construction–I’d imagine that made everything much easier, but this is a pretty simple dress. I’ve washed the dress several times now and it’s holding up nicely so far. I won’t be putting it in the dryer (though I did in the pre-washing stage). All in all, I’m really happy with my new dress! 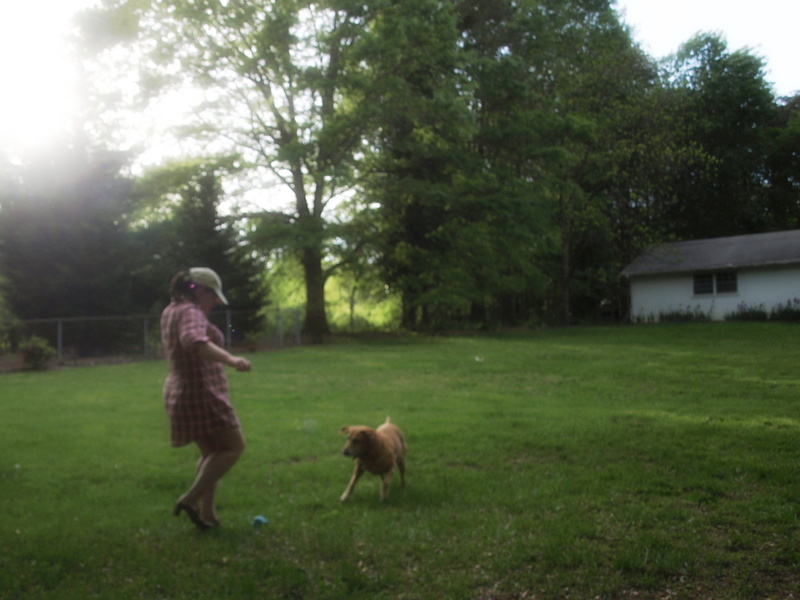 This is Burda 4-2011 which I’ve made three times before (only one has been blogged). I didn’t include the front darts and instead rotated them out into the side seams before cutting (because the fabric is so thick, I wanted to avoid as many darts as possible). This shirt is made up in a Marc Jacobs wool/cotton blend from Fabric Mart that I had the bright idea to pre-wash warm enough to felt (total accident). So, the texture changed from being a smooth flannel to being bumpy and blanket-y. Admittedly, I kinda like it, even though the extra texture makes me look like I’m wearing a blanket. It’s definitely nice and warm, and though my dragging my feet on getting those button holes finished made me worry I wouldn’t have reason to wear it this year, we’ve had another cold snap (they’re predicting snow tomorrow, though it was in the 70s earlier this week). The colors are olive, forest, and navy blue which will fit nicely in with the other fabrics I chose for my SWAP. I think this close up gives a good sense of the texture, though the colors are a bit off as the flash fired. Construction notes: buttons from Wawak. Sleeve plackets done using Thread’s tutorial. Collar done using Tasia’s recent collar tutorial. I’m not sure I like it, though it definitely has more shaping than my previous attempts. Her instructions were incredibly clear and thorough and it didn’t take much extra time to do it her way. I used Wonder Tape for the shirt tail hem (to keep it from stretching) and for any fiddly seam allowances (the collar stand, front button placket–to keep the plaid matched–and the sleeve plackets). In terms of the rest of my SWAP, it looks like the raincoat is going to be scrapped for now–can’t get the muslin how I want it. The sweater is definitely out as I’m making terribly slow knitting progress. I’m thinking of replacing the red dress (though that’s been finished since Christmas, and would save me having to do a new make) with a Madewell knockoff as I think that’ll better suit the style of the wardrobe. My next project will probably be the safari jacket–I’m feeling really inspired about tackling it after seeing the Ralph Lauren S/S 2015 show. I’m going to do the underside of the collar in a moleskin after seeing that they did this one in suede and I liked the subtle mix of textures (plus, I have a moleskin that seems like a suitable match). One of the reasons my wardrobe could use more tops (and separates in general) is that I don’t like to sew them. I like sewing dresses because they’re easier to fit and I don’t have to figure out what I’d wear with one. It can be a challenge to match up fabrics for blouse/shirt weights and bottom weights and still have them coordinate, especially since I don’t necessarily like to wear patterns and tend to buy mostly solid colors. Work with as many on-hand fabrics as possible, particularly a lovely corded olive cotton suiting. Casual separates–stuff that I can wear running errands without feeling super dressed up. Considering I live in an area where overalls were never *out* of style, I may not really be able to accomplish this. Brown Mary Margaret sweater (hand knit? sweater knit?). Though, realistically, I’ll probably use a different pattern as I think I’m too lumpy for this one–but something with cables, boat neck, and fuzzy yarn. Copy of Madewell sweatshirt (don’t have fabric) in green and brown. I love the interesting side, in particular. (Though I have no idea how to hem that side curve bit–something tells me I’ll need lots of practice.) Just discovered a similar pattern in the January 2015 Burda. So, this month I’ve been trying to make shorts that fit me properly. Three different patterns in and I’m not making much progress (hence, no photos). In all three pairs, the fronts are mostly fine, it’s the back that’s consistently… unflattering. Worse, this has prompted me to take photos wearing all the pants I own and I’ve now discovered how unflattering my RTW pants are, too. Eeek! 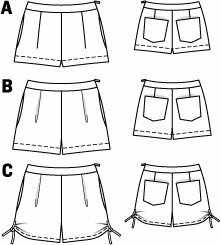 In all three cases, I can get the shorts on and off easily without a closure (as in, I sewed all three zippers and waistbands shut) so it may just be that I’m choosing too large a size. What’s interesting is that the rise on all three patterns are drafted quite differently, so I’d expect the fit to be different as well… I have tweaked one pair according to my most flattering pants (and the curve they follow) and that did help. I know pants fitting can be challenging, and usually I like a challenge, but this one, especially with its repeated trips to the tripod so I can take a photo of myself from behind… I may decide to wear nothing but skirts and dresses this summer! It’s the first day of Me Made May! So exciting. I’m not officially participating (I don’t have that many FOs yet, though I do have enough WIPs that if I get cracking I might be able to meet my “3-a-week” pie in the sky goal). This is an altered version of the Burda 04/2011 #108 shirt dress. I finished the buttonholes on this shirt dress yesterday, but the dress itself has been done for about two weeks while I procrastinated. I have a deep-seated, not-unreasonable fear of my buttonhole attachment–it’s adorable and vintage and very noisy and chewed through this fabric rather roughly. Fortunately, it mostly made a mess on the wrong side so no one’s the wiser and also fortunately this dress is more of a wearable muslin as I wasn’t sure how it’d turn out. I made some changes to the pattern–I used a full length sleeve with a cuff and placket (though I’m apt to wear the sleeves rolled up all the time, I thought it’d be nice to have the option). The placket came from the Threads “How to Make a Precision Placket” article, and I stole the cuff–just a rectangle folded n in half–from a different Burda pattern. 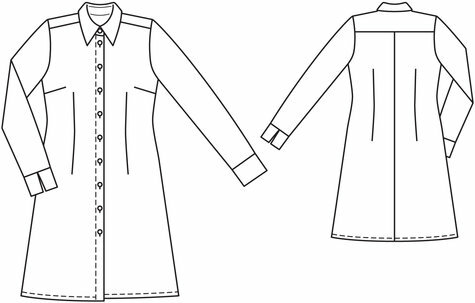 I traced the style lines from version #108 (front and back darts, a-line skirt) but kept one pocket and the hem shape (though lowered quite a bit) from the shirt version. I also traced off two sizes smaller both front and back than my bust measurement and added a 1″ FBA which seems to be a good approach with Burda for me. I’ve been avoiding all things shirt making because there were so many intimidating parts–all the top stitching, the cuffs and plackets, the buttonholes–but in all it was mostly pretty straightforward. 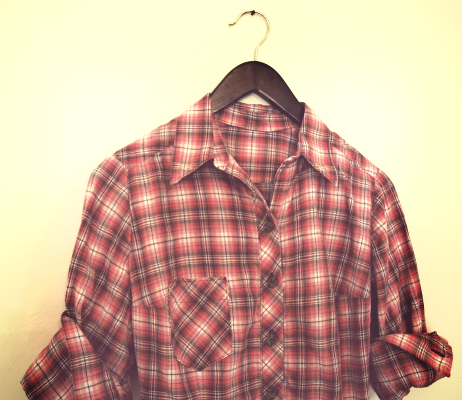 Though I did stretch one front as I stitched the button band down and as a result my plaids (matched in cutting, honest!) don’t match up perfectly. I didn’t bother matching the plaids across the sleeves as I think that makes me look broader across the shoulders, which… isn’t awesome for me :-). It was too dark when I got around to taking photos, (will try to take better ones in the light at some point) but this is what I wore today, off to the library and out for hamburgers, as well as working from home. It’s super comfortable! And what’s more, Izzy seems to approve, and that’s what matters, right? The Deer and Doe Plaintain is an a-line t-shirt that’s been really popular–and with good reason. It’s super easy! I made this one in a stretchy lace that my mom had had forever. (Seriously, forever, I remember this stuff from when I was a kid and it wasn’t new then.) No idea about fabric content, but it’s very stretchy in both directions. I finished it with some narrow lace on each of the edges, mostly because I thought it’d be pretty to dye the whole shebang and have either emerald green or scarlet lace at the neck and cuffs. But, since I still haven’t decided which color to dye it… It’s white. Though it doesn’t look super low cut in the photo, I think I’ll take the scoop neck up a bit the next time–I’d have liked it to come up higher than the tank so there’d be more balance. All zig-zagged, my Brother sewing machine refused to even consider stitching this fabric (kept pulling it into the throat plate, no matter what I tried), so it’s done on a 1960s Singer machine. I thought about underlining it, but decided I liked the idea of being able to swap out tanks underneath. Here’s a closeup of the lace pattern (and the tiny trimmed down seams). For a writing conference, I needed a bag that would juggle all my supplies. I wanted easy access to pens (without having to open the bag) and easy access to loose paper. The front of the bag has a pen pocket and under the flap there’s a welt zipper pocket for my wallet. Then the body of the bag has one large zippered compartment with several dividers stitched in. The back of the bag has one large pocket to hold full sheets of paper (or file folders or whatever) so that when someone handed me something–like a map–I had a place to stash it for easy access. I wanted to add a pocket to hold my eyeglasses to the flap, but ultimately couldn’t decide on a style. It’s just a smidgen too small to hold my laptop (I designed it to hold my laptop and even lined it with an old fleece blanket for extra padding), but didn’t factor in the zipper. I can squeeze my laptop in when the bag is empty, but that kind of defeats the purpose. Next time, I won’t line it with a blanket–it makes the bag extra thick, extra heavy, and extra floppy. Instead, I’ll just make it large enough to fit a laptop holder so that my laptop won’t go unprotected. I also wanted the bag to be much stiffer than it is–and I interfaced the heck out of it. I’ll try a heavier-weight interfacing next time around. I loved the pen pocket–it made things super easy–and the pocket on the back for stashing things. BUT because I’d forgotten I wanted to add the back pocket (I’d planned to do several, actually, layered on top of one another like the credit card section in a wallet), my back pocket is both a little floppy (because it’s just a slash in the bag itself) and also has corners things can fall down into. For paper, a stiff back pocket would be better, so next time I’ll do it the way I’d originally intended. I’ll also add a pocket for business cards to the front, and probably a second zip pocket.